When conducting summer workshops for kids, they need to be presented with certificates at the completion of the workshop. In order to quicken and simplify the process of making and distributing these Sample certificates, we have designed the perfect templates. These adorably designed children’s example Thank You Certificate Templates come in a variety of fun and creative formats, with the option to fill in the details of the child’s name, age and other information. Select and print the sample of your choice and hand it over to the children at the end of the summer workshop. 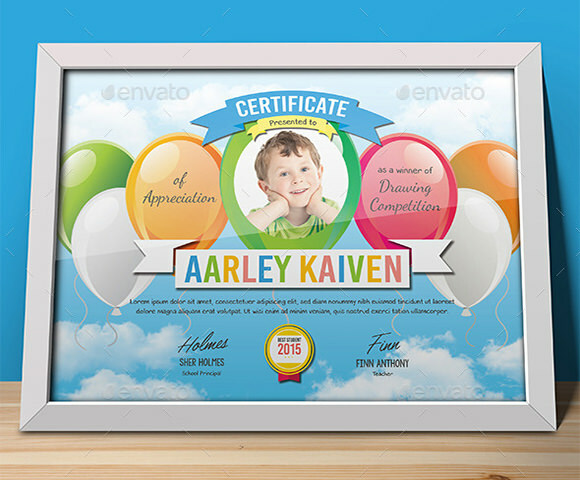 This Children Certificate Template has a colorful design with images of balloons in the background and provision of attaching the photograph of the child in the middle balloon. This certificate supports CYMK colors and is very easy to edit and customize. The user can change the object by using the smart object selection scheme. 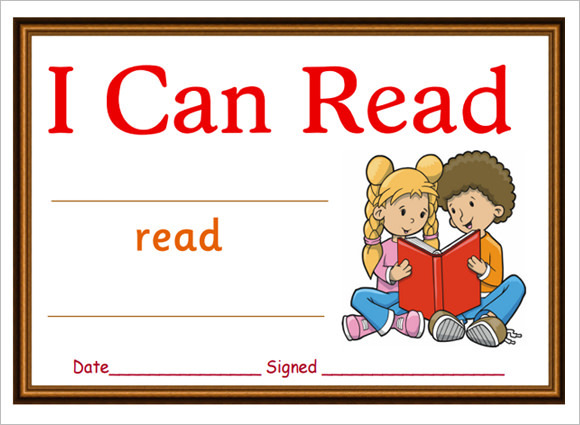 Blank Certificate Template for Kids is fully customizable template which can be used for any event throughout the year. The template has a simple design with images of two butterflies on a white background. The name of the receiver can be printed right in the middle of the page, while that of the organizers goes in smaller fonts at the bottom of the page. 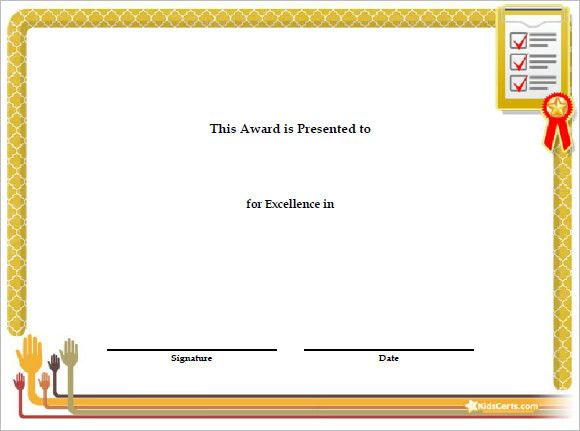 This Kids Award Certificate Template is a fully customizable template whose background theme and colors can be changed depending upon the event category. 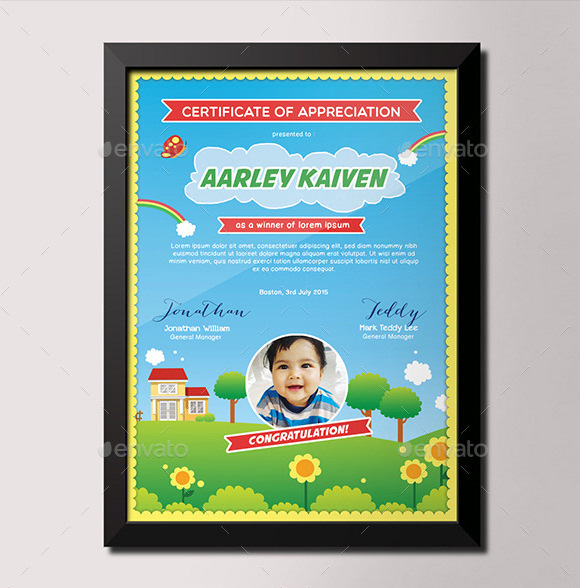 This template is basically used to design certificate of appreciation and contains the image of the child in the certificate. It describes the event for which it is provided and is signed by the organizers to give it an authentic look. 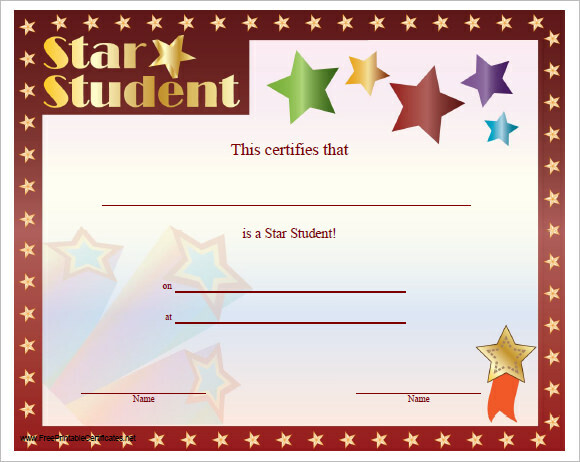 The Star Student Certificate Template is designed on a white background with dark brown borders and contains images of several stars. The certificate is meant for students who have performed exceptionally well in some domain. Besides the star design the template is relatively simple and has spaces to certify the name of the student and his domain of excellence. 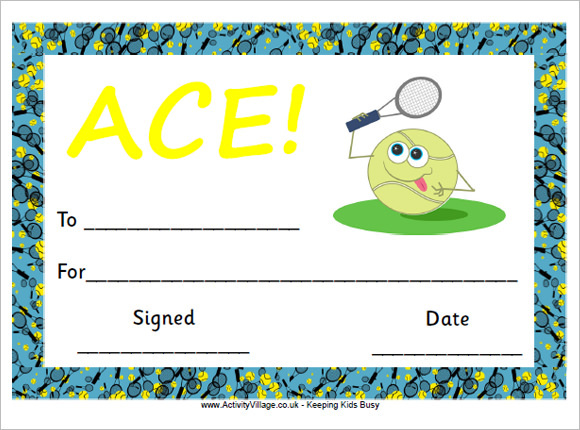 Printable Tennis Certificate for Kids is perfect for any kind of sporting events or sports meet. It has very simple design, portraying the image of a cartoon playing tennis with racket on the left hand corner. The words “ACE” is written on the left hand top corner and below that the name of the candidate and event is mentioned. This template is designed on a white background with a bright blue borders containing small images of tennis rackets. 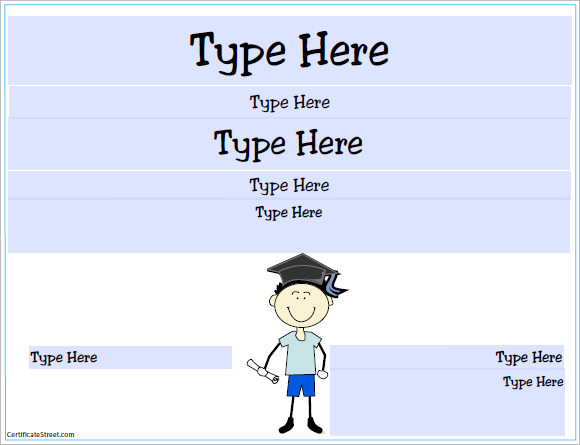 This Young Boy Graduation Award Template is meant for kids who have just passed primary school and have enrolled into secondary school. The event may be a simple thing for many of us but it holds a special significance for young kids. This certificate with the image of young boy with a graduation hat would surely make him feel extra special. Good behavior can be reinforced in children by appreciating them for good conduct. 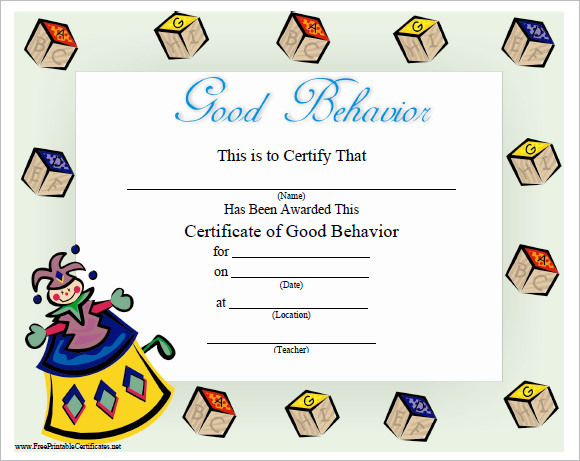 The Sample Good Behavior Certificate does that in a beautiful manner. The template is designed on a white background with images of a clown and dices on the border. The name of the student along with the date and time is specified on the middle section of the certificate in black ink. 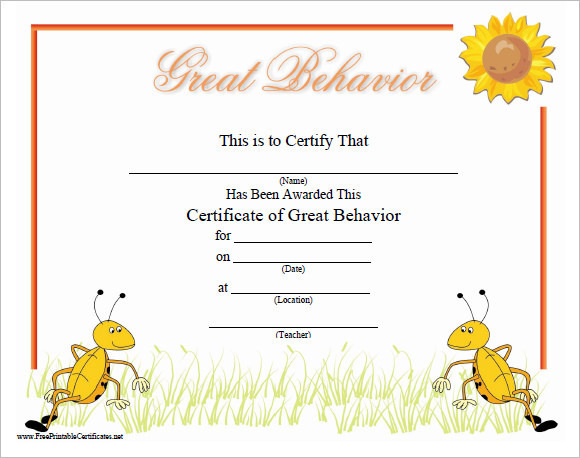 This is yet another sample of Great Behavior Certificate which can be given to a child both at home or at school to keep him motivated to keep up the practice. This certificate has simple designs and very cute and colorful images like that of honey bees and sunflowers on the corners. This is a rather simple and plain template that can be used for any purpose. The temple has golden borders, along with symbols of raised hands on the bottom left hand corner perhaps to symbolize appreciation. Another image of a certificate along with a medal adorns the top right corner of the page. The name and occasion is specified write in the middle on a plain white background. Kids love colors and interesting images. Designing a perfect template for them is not an easy job. 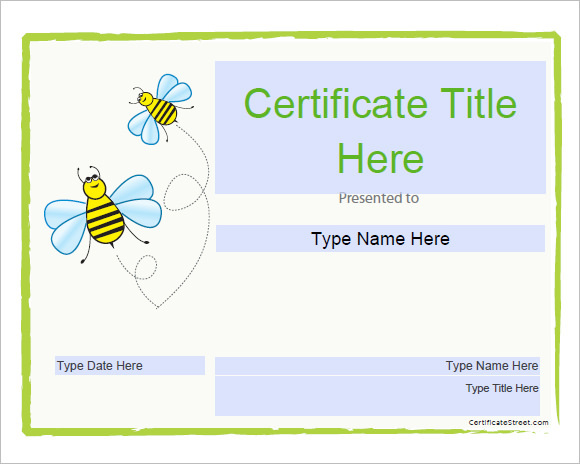 The above sample of kids’ certificate template would surely make your job of finding the perfect template for kids a lot easier.